If your department do not have a large budget for hand held explosive or drug detector you may want to consider our tactical Chemical reaction detectors. In expensive and accurate solution of in field operations. Expray Plus PDK Explosive Detection Kit features the same Expray aerosol presumptive test as in our Expray Explosive Detection Kit, which can detect and identify Group A explosives e.g. TNT, TNB, Group B explosives e.g. Semtex H, RDX, C4, and compounds containing inorganic nitrates used in improvised explosives e.g. ANFO. 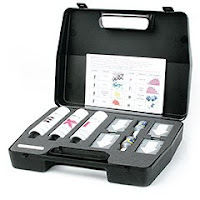 In addition, this kit includes the PDK Explosive Kit above for the detection of chlorate and peroxide-based explosive compounds, including TATP Triacetonetriperoxide. The kit comes in a rugged carrying case for easy portability and use.